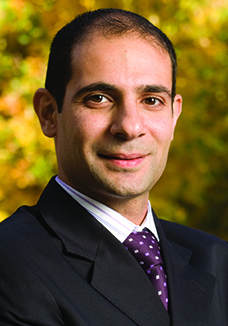 Dr. Elie Y. Hajj is an Assistant Professor at the University of Nevada, Reno and Associate Director of the Western Regional Superpave Center. While I always had a passion for math and science, problem solving is what specifically drew me into civil engineering. Learning how to solve engineering problems is a unique skill a civil engineer acquires during education and continuously keeps on improving throughout his career. During my undergraduate studies, I gained more interest in geotechnical and transportation engineering. After consulting with Dr. Sebaaly at UNR, I was astonished by the extent of research being conducted in the area of pavement engineering, and in particular, asphalt material. I then came to realize that pavements are an integral part of our everyday life. What are some of the newest ways to quantify the influence of asphalt binder oxidative aging on mixture properties? There is an immediate need for a more complete understanding of the influence of asphalt binder aging on the behavior of asphalt mixtures. Vice versa, it is also necessary to comprehend how mixture characteristics (e.g., aggregate source and absorption, mixture air voids) may potentially influence oxidative aging of the asphalt binder within the mixture. One of the most recent approaches correlates oxidative aging of asphalt binder in terms of carbonyl functional groups to the viscoelastic behavior of asphalt mixtures in terms of a continuous relaxation spectrum. While a consistent horizontal shift in the continuous relaxation spectrum of asphalt mixtures is typically observed with aging, the shape and amount of shifting are highly mixture dependent. Why the urgency for a low temperature characterization of asphalt mixtures under thermal loading? While the low temperature PG clearly provides a good indication of the low temperature properties of the asphalt binder, it usually does not fully capture the resistance of the asphalt mixture to thermal cracking. Mixture characteristics such as the aggregate absorption, aggregate mineralogy and the complex binder-aggregate adhesion properties are all effects which are proving to significantly influence the thermal cracking resistance of an asphalt mixture, all of which are necessarily blind to the PG binder grading process. Test results have indicated that mixtures containing the exact same asphalt binder mixed with different aggregates do exhibit considerably different resistance to cracking under thermal loading. Furthermore, it has been shown that asphalt mixtures made of asphalt binders with similar PGs may behave differently depending on the type of the binder modification. Tell us about a new asphalt mix testing for characterizing the resistance of an asphalt mixture to thermal cracking. The Uniaxial Thermal Stress and Strain Test (UTSST) allows for a comprehensive characterization of asphalt mixtures under thermal loading and as a function of aging. The UTSST represents significant improvements over the traditional Thermal Stress Restrained Specimen Test, both in terms of practicality of testing and test equipment, as well as technical relevance. In addition to measuring thermal stress build-up, the UTSST measures thermal strain during cooling, which permits a direct determination of temperature dependent coefficient of thermal contraction. Further, the direct calculation of the mixture stiffness, and the definition of phase changes within the mixture, including softening, glass transition and ultimate stiffness before damage initiation are all basic material behaviors noted only in stiffness-temperature relationships. Research in the asphalt field should focus on means to enhance the design, construction and maintenance of a sustainable asphalt pavement system. For example, the frequent change in asphalt material sources and properties along with the variation in traffic and climatic conditions necessitate the development of a mix design optimized to the site-specific characteristics that can result in an extended pavement performance life. Such effort requires the development, validation, and implementation of engineering tools for proper evaluation and characterization of asphalt mixtures.